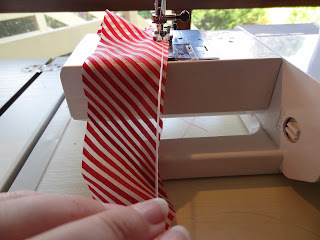 JuliaBobbin: Tutorial: Machine rolled hem with fishing line + Brooch Giveaway WINNERS! 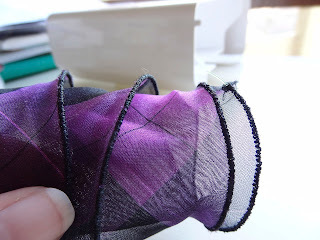 Tutorial: Machine rolled hem with fishing line + Brooch Giveaway WINNERS! Me: "Hey honey, do you have any fishing line?" Husband (H): "Yeah probably, why?" Me: " Oh, I need some for my sewing." Slight pause as he contemplates whether it's worth asking how the heck I can use fishing line in my sewing. Decides it's best not to ask. H: "Oh, ok sure. I'll get you some." 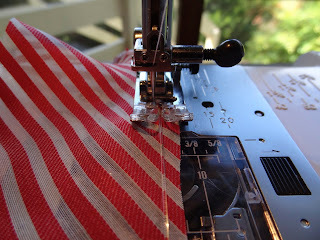 My latest tutorial involves a beautiful structured rolled hem with the aid of fishing line, and all sewn on a sewing machine! I learnt this technique from an inspirational and absolute sewing master who is the grandmother of a very talented friend Katherine. We shall call her 'Katherine's Grandmother'. A big congratulations to the following two readers who have each won a brooch! Congratulations ladies! I will be emailing you shortly with details. Do not despair if you missed out. 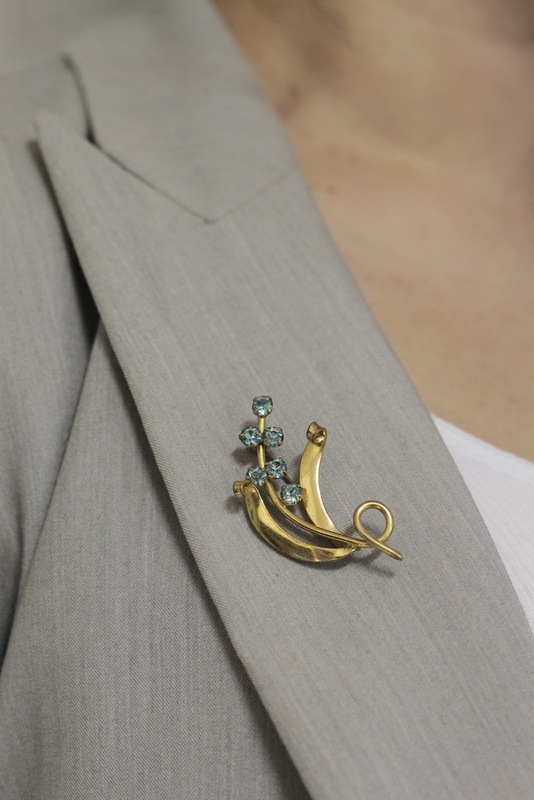 You can buy your own fabulous brooch at Ruemiraldi's online store. 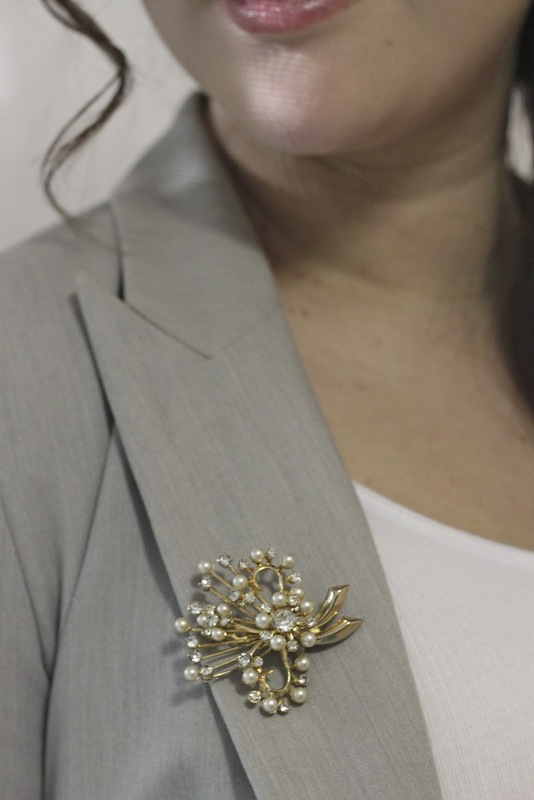 Thank you again to Ruemiraldi for providing me with these fabulous brooches for this giveaway. 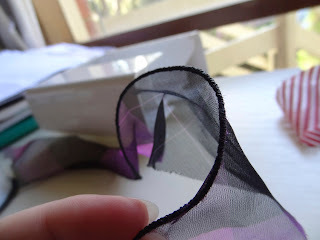 Fabric strips cut on the cross grain Looks really pretty on light weight fabrics like silk, organza and tulle. Fishing line (seriously) 55mm, 30 pound line - you can experiment with different thicknesses. Have fun walking into a tackle shop in your gorgeous couture and asking for fishing line. Tell the shocked shop attendant it's for sewing. Enjoy watching his freaked out expression. The wide stitch will help flick the edge of the fabric around the fishing line, the short length of the stitch will make the stitches nice and close together, keeping everything in place and looking pretty. Position the fabric so that there is about a 1/4 inch seam allowance. This allowance needs to be small because it will be flicked up into the stitch and 'rolled' to make the hem. Place the fishing line directly on top of the fabric, centred through the foot. If you were doing a straight stitch the fishing line would be directly under the needle. Because it's a zig zag stitch the needle will always fall either side of the fishing line. 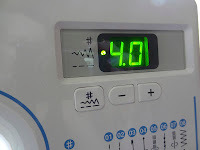 Make sure you pull a bit of fishing line out the back of the machine, just like you would do with the first threads. You're going to want to gently hold onto the fishing line for the first few stitches so that the stitching doesn't get stuck and bunch up. Once it starts moving you can let go. Lightly guide the fishing line so that it stays near the edge of the fabric and centred under the foot. You can see above how I'm holding onto the line to keep it close to the edge, but I am not pulling on it. Guide, don't pull. Finish the row of stitching and then trim the threads and the fishing line at the ends. You end up with a flouncy, 3D structured hem. Nice huh? Katherine's grandmother would explain this better (and do a much prettier job) but you get the idea. I love how it can all be done on a sewing machine (yay to no overlocker/serger!) and the result is so strong and pretty. This look would look great as a feature on a one shoulder dress, or as flouncy sleeves, or a veil for a wedding dress. The possibilities are endless! Oh, and for those with a strong stomach (get it?! get it??!! ), here's what I made for my Halloween costume this year. Disgustingly awesome and mildly inappropriate. Great tutorial! Im really bad at doing these rolled hems, especially if you do NOT want the fabric larger at the hem than it was before. 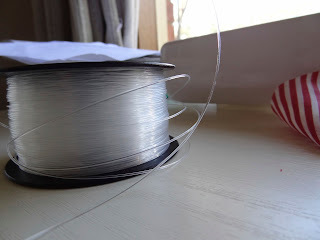 I wonder if you could substitute thin wire for the fishing line, and make your own wired ribbon?! Good God that is a fabulous idea! I'm going to have to try that! Hahaha! Your Halloween costume is so gross! It's the best I've seen so far! Triple like! Heehehe I was going to have the same halloween costume but got worried I was going to scare the smaller trick or treaters. LOVE it! I love you just for that costume. The tutorial was greta, but the costume. Damn. 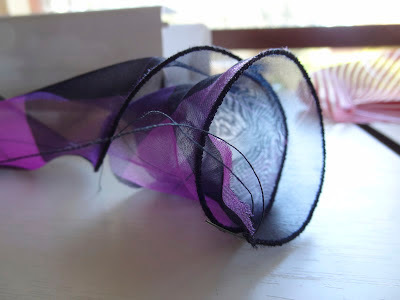 I made a hem like this for my daughter's Irish Dancing dress. It's a pain to yards and yards of, but very effective! Love the Halloween costume. It's funny, and kind of witty. Well, I guess it's funny for those of us with questionable taste, lol! I can't believe I won that gorgeous brooch! Thank you so much for this lovely giveaway! Your Halloween costume is great! Funny, and of course little baby wanted to be included :) Love it! I should post a picture of my Halloween costume.... my mom sewed it for me a few years back and it's over the top ridiculous. A full body suit devil costume made from red hologram spandex, complete with a stuffed tail attached at the lower back/end of zip, and over-sized stuffed horns atop the fitted hood. BEST HALLOWEEN COSTUME EVER EVER EVER. I don't know what stuns me more, the awesomeness that is fishing line sewing, or that totally HILARIOUSLY amazing Halloween costume of yours. SO GOOD! Love the costume (not what I expected!). Your baby is going to have such fun with you guys! What a great technique! Thanks for showing us. What a costume lady!! Love it. A stroke of genius! I must try this :). Adore the Halloween costume - would have loved to be a fly on the wall as you went public with it! Firstly, Congratulations to the winners of the brooches - I hope you will enjoy wearing them. Julia, Your sewing skills and patience are amazing. 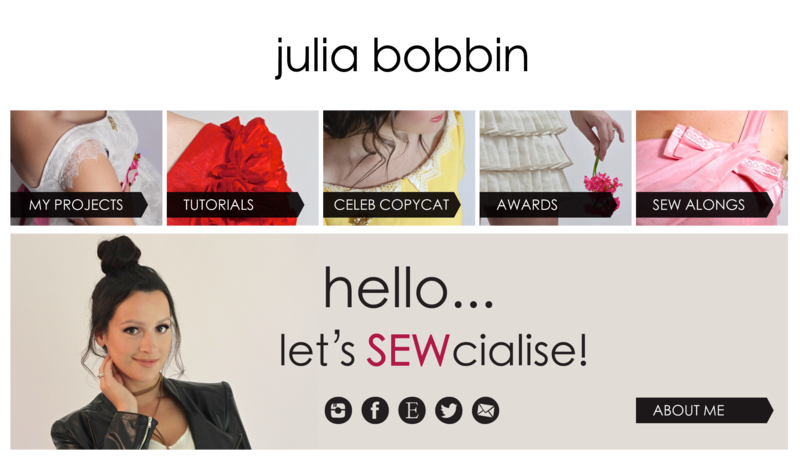 I'm looking forward to seeing your next sewing creation. 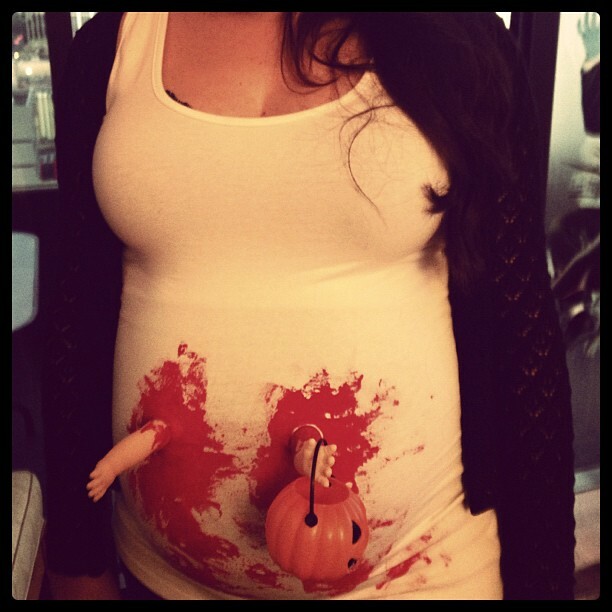 As for the Halloween costume - you are so clever...and it is so scarey! Whoa, what a great idea! I love this! Thanks for sharing the kickass tutorial! i'll have to use this method for my next Melbourne cup. It could work a treat on a hat. I laughed out loud at your Halloween costume, so so funny. I IMMEDIATELY pinned this tute before I even read the whole thing, haha. I can't wait to have a reason to try it! Thanks for the fantastic tutorial! and for your kind words on my blog. You are sweet :) and I am sad you got horrible comments too, but glad you have risen above it and are going on in your gorgeous cheerful way. 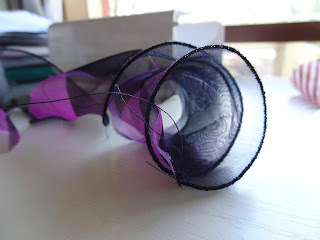 Fishing line is a fabulous addition to the sewing room. When I sewed wedding dresses I always edged veils with it, yardage was seriously painful (not to mention wrangling all that tulle!) but the result was always worth it. HI. This may sound strange to you but I have a question here please. Is it possible to actually use (finer of cause) fishing line instead of thread. 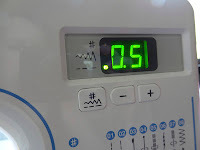 I wouldn't tell you why as it has nothing to do with dress making and you would probably laugh but I have about 50 metres of sewing to do and using a machine would speed things up a bit. To the question about rolled hems "growing" I usually solved that by running a line of straight stitching a scant 1/4 inch away from the cut edge. 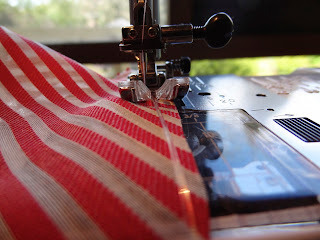 Then when I used my hemmer foot, the stitching prevented the cut edge from stretching. But with the fishing line, I guess you want it to "grow," right? So you could skip that step. Thanks for this post. Very inspirational!